Galvin Joseph was among the students taking part in a recent musiConnects program at the Lena Park Community Center. The post office in the days before Christmas ranks up there with the Registry of Motor Vehicles for many people’s least preferred places to spend an afternoon. But last December, patrons at one Mattapan post office received a pleasant surprise. The Sumner Quartet, one of two string quartets affiliated with the Roslindale-based music education program musiConnects, made a stop on its “errands tour,” bringing pop-up concerts to unexpected places around the neighborhood. The musicians performed classical music and holiday favorites and chatted with onlookers. “The idea behind the errands tour was to strip away any barriers people might have, perceived or real, with chamber music and classical music, and to make it more accessible,” said Nancy Galluzzo, musiConnects’s executive director. 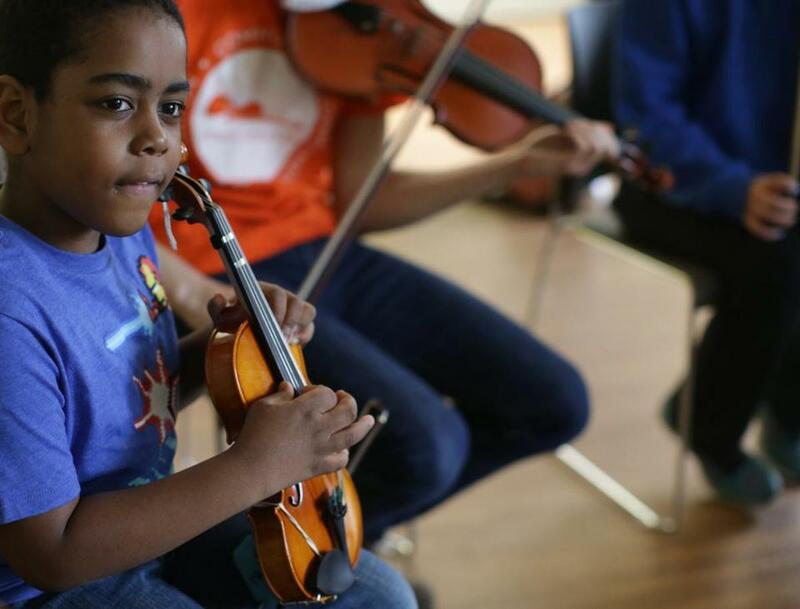 With that vision, musiConnects offers not just free performances but also free education, giving children from underserved Boston neighborhoods in kindergarten through grade 8 a sustainable pathway to learning music. It operates in Dorchester’s Lena Park Community Development Corporation, Mattapan’s Boston Centers for Youth and Families’ Mildred Avenue community center, KIPP Academy in Mattapan, and its own Roslindale Village studio, which offers lessons on a sliding scale. The organization was founded 10 years ago by New England Conservatory alumnus Betsy Hinkle, who teaches violin as a member of the Boston Public Quartet. Chamber music and private lessons form the core of the curriculum, with children placed in small groups as soon as they can play a scale. From the beginning, kids learn concepts such as listening to one another, leading, cueing, and improvisation. With musiConnects, however, “there really hasn’t been a promise of anything,” she explained. “Just a really good example that they’re in it for the long haul.” Burks said she has noticed more parental involvement as word about musiConnects has spread, with more parents and guardians attending performances and encouraging their children to practice. To introduce the program to prospective students, musiConnects holds public enrollment nights with performances, information stations, and a musical “petting zoo,” where both kids and parents can try instruments. “The combination of the resident musicians playing and also students performing who have been in the program has a lot of power,” said Galluzzo. “The message is that we’ll stick with you if you stick with us,” Hinkle explained. And the lessons learned can extend far beyond music. David Rubin, a violinist who became a resident musician at musiConnects this past fall, described a recent rehearsal in which his sextet of middle schoolers got through only one measure, frustrating him until he realized that the students had achieved the kind of comfort with one another that he had been seeking. In May, musiConnects plans more free performances around Mattapan. And at a 10th anniversary celebration, May 18 at the Boston Nature Center, local restaurants will provide food and drinks, and musiConnects educators and students both past and present will perform. Zoë Madonna can be reached at zoe.madonna@globe.com. Follow her on Twitter @knitandlisten. Madonna’s work is supported by the Rubin Institute for Music Criticism, San Francisco Conservatory of Music, and Ann and Gordon Getty Foundation.